The Triumph Tiger 100 is a 503cc, twin cylinder, four stroke, street motorcycle manufactured by Triumph. The designer was Edward Turner. 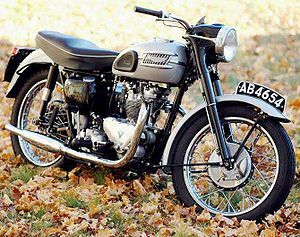 Like the Triumph Speed Twin, the Tiger 100 used gears instead of a chain to drive the camshaft, and both cylinders were fed by a single Amal carburetor, which was possible thanks to the 360-degree firing interval of the two cylinders. This page was last edited on 6 February 2009, at 19:53.